Thanks Bernadette and Duane! It fits!! And, so darn cute! Daddy has become a bum changing pro! Wubbanub pacifier...only use it when someone decides to meltdown, or her food is not ready quick enough. Very impatient little girl. Thanks Rebecca!! I wanna watch that re-run of Friends ...if I could only crank my neck a bit further towards the TV. Definitely one of the best things we brought to India...a very cheap bouncy chair. This morning we had an invitation for lunch from Douglas and Chad , of course we accepted! In an unusual manner we went to the US Embassy for lunch. It is like an ex-pat compound with a great restaurant, pool, bowling alley and a few shops. Mark was pleased to have an all beef burger while we all chatted about India, surrogacy and random things. It was a real treat for us and we really enjoyed our company!! D&C invited us to their home on campus for tea after lunch. The grounds where they live are absolutely beautiful, and to our surprise they have a yellow Lab that smiles, literally toothy smile! Joti the dog is just beautiful, and the constant dog smiling was a riot! Douglas and Chad have a beautiful home and are starting to prep for the arrival of their twins later in the fall. We cannot thank them enough for the meal and company, we hope to meet again before we leave. The 5 of us at Doug and Chads house after tea. Beautiful grounds on campus - was really nice to walk on grass! Beautiful grounds on campus #2. An unusual tree with amazing air roots! The fam at the tree. Look at me wiggling around!!! A common site here in India -children performing in the street for money. Today they all had moustaches drawn on their faces. We are hoping to have lunch with Adam and Michael, but Adam has been under the weather. Hoping Adam feels well soon! Baby Beau continues to be beyond adorable! Also at ILH is a couple from Ireland who's baby boy was born two days after Cailyn. He is so sweet and adorable, and a hungry boy keeping mommy and daddy up every two hours! Dr Shivani announces baby Cailyn's birth with some very kind words towards us! Click on the picture to read. Cailyn's umbilical stump fell off last night, YAY for that - its kinda gross. (Mark kept asking me if I wanted to keep it...like Meet the Fockers how they kept the foreskin) To celebrate this she had her first real bath, which she loved!! Cailyn got all dressed up in her blue and pink outfit ready to head to the Canadian High Commission for her DNA test. Nothing to drink/eat for one hour prior is not an easy task for a baby. We tried very hard to encourage a feed before the cutoff time but no luck, so of course en route to the Commission we stared to have a fussy baby. By the time we got in for the swab she was not a happy camper! She took the mouth swab fine, but the thumb print was a whole other story! This was the first time we saw a tear come out of her eye...she was just so upset. The nurse was sympathetic but the task at hand had to be completed. Once she was done, she really enjoyed her bottle. The delay in feeding sure had a ripple effect for the rest of the day with constipation and absolute fussiness. I guess there is a good reason why we try to keep these little ones on a schedule. We now will wait about a week for DNA results. Once the High Commission gets the results they will start the passport process. We hope to have the passport by September 7th, fingers crossed! This evening my buddy Nilesh came over and we had a meal together. I worked with Nilesh in Canada and we have remained in contact since. He is from Hyderabad but his head office is in Gurgon, close to the airport. I had hoped to get a pic of him and Caylin but the time flew and it slipped my mind. He brought some beautiful pink girlie gifts for Cailyn which was so generous and sweet. The ongoing support of Anna Hazare trickled into GK1 today and the supporters took over M Block market. The activity remains calm at Hazare's request. The people of India love Hazare, so, we will see how the government reacts over the coming days. Hazare is 84 and has been on an 11 day hunger strike. His health is a big concern now and the police have asked him to minimize how much he speaks to the 100'000's supporters in an effort to save his energy. It is indeed an interesting time to be in India! Today was one of our many free days - looking for something to do to make the time pass. First thing in the morning we went for Cailyn's 48 post discharge appointment with Dr Sanjay Tandon . He did a good check on her jaundice and said she has minimal to no jaundice YAY!!! He also asked us if we had any concerns or basic baby care questions. We asked about the discolouration her eye lids and he said a few weeks to a month this will be gone. Also, he showed us how to take care of her long nails without clippers or files - simply using our own fingernails...very cool! Her pulse and heart are great, and capillary flow is at 3 seconds which is perfect! It was so great to visit him and have him spend time with us on a physician level and also on a more relaxed friendly level. He had us cracking up talking about how stupid parents can be, and he basically said "if they choose not to listen to his diagnosis and advice then they can go to hell". A real down to earth doctor, very enjoyable experience with him! He also got her lab results and reviewed them with us, so, thyroid is good, CBC good, etc... We were also given Cailyn's blood type and told she does not have a heart murmur. Just an all around good news story for our girl! The visit with the doctor is very affordable at 1000INR (about $22.00). Here is our girl today, all jaundice free! I knew Mark would be an amazing dad, and sure enough, he is! Mark takes on some of the night feeds, cuddles Cailyn, tends to her needs and all in all doats on her! He laughs when he takes off the dirty diaper and then she pees on the change mat and he has to do a big clean up...such a patient dad. Hungry baby likes to be fed by Daddy. After the doctor we headed to Select City mall. We basically enjoyed lunch at the Punjab Grill and bought a few more bottles and laundry soap - very exciting stuff. Cailyn was a very good girl at the mall and needed one change and feed while we were there. The rest of the day was relaxing at home, staying cool. Tomorrow we have our DNA test which means the ball is rolling in going home. Only about 21 days to go!! Today was a dead quiet day for us! We ended up totally flaking out at home today with Cailyn. India Luxury Homes staff have been so great to us. They were all very concerned about "baby", including the security guard out front. When I was coming back and forth from the hospital Hariz would offer me coffee as I walked in..so sweet, taking care of me. We have our DNA test booked for Thursday! This should be fun as none of us can have anything to eat or drink one hour prior...could lead to a really cranky baby. We will have to adjust her feeds a bit Thursday to prevent a melt down! Thanks Amber and Brian for the pretty girl clothes! Looks a mess but really isn't. Thanks Amber and Brian for the cocoon! Tomorrow Cailyn will be one week old, hard to believe how quickly time flies! For her one week b-day we are back at the hospital for a follow up visit then have decided to hit up Select City Walk mall to enjoy the air conditioning, have lunch and stretch our legs a bit after a lethargic day at home today! 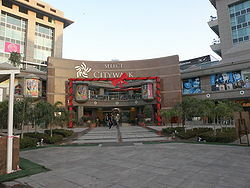 For those who do not know it is a very large western style mall with loads of nice shops, but a bit pricey. I guess we are starting a bad habit of shopping sprees on her birthday! After being discharged from the hospital today we had to go to the Canadian High Commission to retrieve one piece of paper. This paper acknowledged our request for citizenship and passport and asked us for DNA testing. We took took this letter and the DNA application, scanned and emailed it to Orchid Cellmark DNA testing. They very promptly liaised with the High Commission here in New Delhi to set up our appointment. We are hoping that tomorrow we hear of a scheduled date. The process takes about a week, but Orchid has said they will try to complete it in 5 days for us. After this, we will obtain a temporary passport for Cailyn. This will take 3 days to process, and in order to process it we need proof of return flights for all of us. We have booked a reservation as of about 1 hour ago. Since it is high season and Eid is upcoming there were no seats until Sept 12th onward so that's what we had to take. Cailyn is doing really well. We are blessed with a very calm baby who is happy happy all the time! Here she is post UV bed looking hot and red. What a long few days in hospital!! Cailyn did well under the lamps, and only had one melt down at about the 14 hours point and after that she was a trooper! Having a feed after many hours under the lamps - she was hot hot hot! Breaks my heart! Day two she had the lower lights turned off and we were able to add a soft mattress and soft blanket to cover the mattress. The eye wear is provided by the hospital. We have a re-check in 48hours with the pediatrician. Now, we are off to the High Commission to gather our file number so we can initiate the DNA process. After DNA, our immigration consultant will help us get a passport in 3 days, the we have the MHA and FRO office, then....home! She has been admitted for 24 hours and the secondary tests this morning showed a decrease in Bilirubin which is great, but as a precaution we have been asked to keep her in for another 18 hours. Poor little girls HATES the UV lamps as it is too hot and she is naked and not being cuddled except to feed. For mommy and daddy it is a sad site which is worsened emotionally by being trapped in a hospital room that is 500 degrees Celsius! As we were going to our room we had a chance meeting with our surrogate Sumita who was in the process of being discharged. What an emotional scene in the hallway!! I started bawling and Mark was all tears. I was thanking her and asking her if she was ok and she said yes, and she thanked us immensely for the opportunity. She did get teary eyed and held my hand and then we looked at the baby together and Sumita smiled, happy to see this little miracle. Another woman with her who's English was better said Sumita is happy and thankful for the opportunity and happy to see the baby. It took me hours to recover from this chance meeting, and still as I write this I am emotionally exhausted and teary eyed. I have just come home for a shower so have internet access and figured I would post a quick update for those waiting. Anyone coming to Dr Shivani should know that Spring Meadows hospital is a very good facility. They follow all the American Medical association protocols and leave nothing to chance. Both the senior and junior pediatrician are very good and have baby Cailyn's health as concern #1. Before leaving the hospital the Dr. asked us to feed and burp her to ensure she was ok.
Paras's Spring Meadows Hospital New Delhi- SCI Labour and Delivery - great hospital! Her first night with us was quiet. She obviously sleeps alot and we have to wake her to feed. She is not loving the rude awakenings, but she has to feed! Friday morning we headed off to the Canadian High Commission to start the citizenship process. But, first stop was at the photographer for Cailyn's Immigration and Passport shots. She refused to open her eyes inside the building so we had to take her out into the sunshine to get the eyes open shot. What a little trouble maker she is! Awe...that's all to say about this! (I set this up - she actually sleeps in a bassinet). India Luxury Homes has also provided us with a full size crib. Amazing service here! Tonight we went to M Block to buy a Pigeon brand bottle. This is what the hospital uses and we are thinking Cailyn will maybe take her feed better with it than the bottles we brought from home. Mark ended up carry baby C in the sling and boy oh boy did he turn everyones head at the market!! And lastly...just after bath time..
What a day!!! Cailyn was born at 2:22pm and we were not able to see her for 4 hours afterwards. When we arrived at the nursery we were able to see her one at a time. We had to scrub our hands, suit up in gown and slides and then use copious amounts of hand sanitizer. Cailyn has 4 room mates - two preemies who are doing very well, and two boys born today - one before her and one after her. I went in first and she was fussy - hungry! The sister gave her a bottle and she wouldn't have any of that so the sister had to spoon feed her. After a few ounces Cailyn calmed down and went back to her bed. At this point the reality of it all hit me an I had a mini meltdown. I recovered quickly and then let Mark have his time with his daughter. Mark was fortunate to be with Cailyn when she got changed into clothes brought by mommy and daddy and then swaddled in her Adan & Anais muslin blanket. She seemed to be very content in her fresh clothes and blanket. Cailyn had blond hair and blue eyes, daddy's lips and chin, and my nose. Absolutely perfect!! We were not able to hold her, but were allowed to caress her. It was awesome! Tomorrow we will return to the hospital in the morning when we will finally be able to hold and feed her. A long day with loads of excitement! Thanks to you all for your support and the 65 emails! It is Hot in Delhi!